I planned to reopen the store from today, but am going to close until next week, on 18. 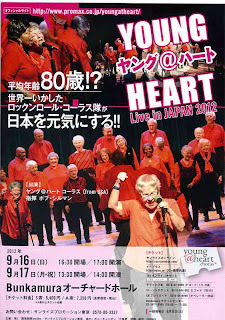 American chorus group "Young@Heart" that an average age of members is 80 years old is visiting Japan for live concert and I work as a part of them now, and am accompanied them until they leave Japan. I open the store again on 19, but may have the frequency of temporally closed until the middle of October. Sorry for the inconvenience.